ADF has several unique features to model processes at the molecular level such as charge transport, exciton coupling, and phosphorescence. These molecular process are important for optimizing the performance of materials used in organic electronics devices such as organic light-emitting diodes (OLEDs), organic field-effect transistors (OFETs), photovoltaics (PVs and OPVs), and dye-sensitized solar cells (DSSCs). See also the presentation on modeling organic electronics, a recent poster, research publications, and an invited high-level article on modeling organic electronics with ADF. 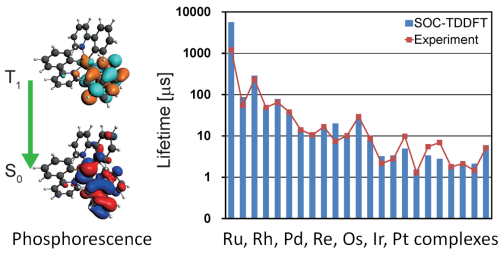 Organometallic complexes undergoing rapid intersystem crossing to a long-lived triplet state achieve high quantum efficiencies in OLED devices. Phosphorescence back to the ground state is spin-forbidden. To rationally design improved OLEDs, predict phosphorescent lifetimes and zero-field splittings with spin-orbit coupling TDDFT in ADF. Intersystem crossing rates can be estimated from SOC matrix elements (SOCMEs) with ADF (see highlight). Organic or organometallic molecules which can quickly reverse intersystem cross from the T1 to the S1 state exhibit delayed fluorescence (TADF). To virtually screen improved TADF emitters, one could maximize SOC matrix elements (SOCMEs) with ADF, while simultaneously minimizing the S-T gap. With The averaged S-T SOCMEs are easy to grab from the standard output with the PRINT SOMATRIX. Effective TADF emitters usually have spatially separated HOMO and LUMOs, which are more accurately described by using a tuned range-separated hybrid (RSH). A PLAMS script automates such tuning (see tutorial). The periodic DFT code BAND calculates effective masses, which can be used to calculate mobilities with the band transport model. 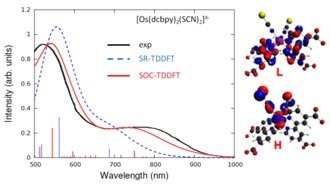 Excitation spectra of Ru and Os dyes are accurately predicted with spin-orbit coupling TDDFT. The unique fragment-based approach in ADF has been used to scrutinize the available energy for electron injection into TiO2 after dye excitation. Modern functionals, relativistic effects and solvation were employed to study N3 dye regeneration. In BAND, electric fields and solvation effects (COSMO) on molecule-surface interactions can be modeled with proper 2D periodicity. We have selected a number of relevant publications where ADF has been used to study organic electronics.